Differences in front lower control arms? - Racing Studebakers! Can anyone tell me what the differences are between '52 champion control arms and '66 commander ones? Long story short I have a '66 that might break in half the frame is so bad and I have to modify the lower control arms on my '52, so I was hoping I could rob the '66 ones and hack them up so my '52 can still roll around in the mean time. I was also going to grab the kingpins and spindles for the more favorable caster and lower the front end a bit. Thanks a bunch, guys. I know they have different part numbers, but you guys are better versed in making stude stuff work so I was hoping someone would have some experience with it. Re: Differences in front lower control arms? I have never worked on a 52. I have had a number of 53's. There is no noticeable difference between the Champ and Commander arms, thickness or dimension wise. I have put my 53 K arms along side 62 GT Hawk arms and they look like they can bolt right in. When you lower a Stude in the front, you make some other undesirable changes. It gives you more pro dive. It changes the caster. And the camber curve is different. The moment center is further under the ground. Well, I have read (although haven't investigated yet) that the later model kingpins/spindles act as a drop spindle, more or less, which would minimize those changes, with the exception of the design changes they incorporated into the later kingpins. Also doesn't help that the moment center is already on the wrong side of the vehicle due to suspension geometry. Sigh. They don't "act" as dropped spindles, the spindle pin actually is...in a different location. So yes, with the later spindles, the front of a car changed from the earlier spindles, will be lower by about 1.0". And yes, while I haven't actually measured the angle difference, the king pin angle is also different, providing more caster. Best of my understanding, a 53 up suspension will not bolt onto a 52 and earlier chassis without a fair (lot) amount of work. Completely different parts. A frame cut, swap and weld might be the easiest way out. 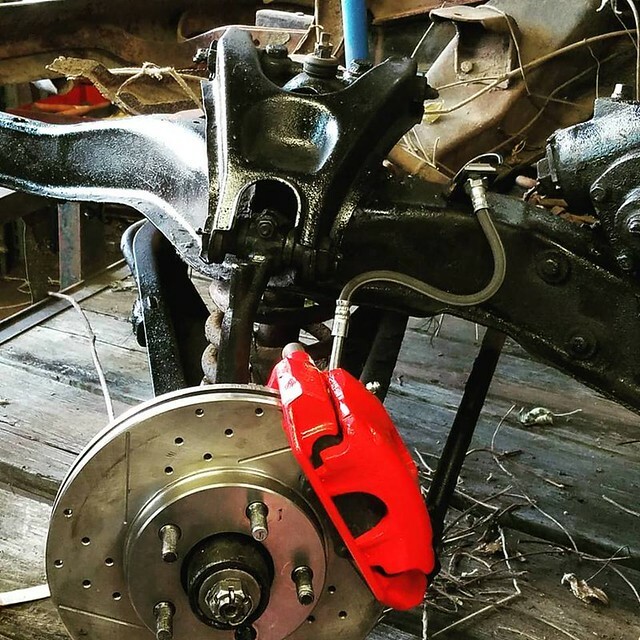 Much more than just a lower control arm swap. We're on the same page with the dropped spindles. I just said that they act like them because a dropped spindle, at least in my opinion, is typically referred to as an aftermarket part, whereas this discussion is primarily focused on factory parts. Just a difference in terminology is all. I can say with certainty that the disc brake parts that I machined, as well as the wheel bearings and hubs (shown below), will fit our '64, and visually the general design is the same as my '66 that's rusting away outside of the shop, but I haven't measured anything to confirm that. I'll address the moment center on a separate comment. Mike, There are a number of words used by different books. Circle Track Mag. Herb Adams Chassis Eng. And the Smith Books. I think he is referring to the instant center as being outside and at a 20 degree angle to the center line of the car. The bad thing about the Stude suspension is that there are so many angles and nothing is in the same plane. With a Stude and those upper control arms, when the body rolls the camber goes negative. Nothing you do without going to a longer king pin can correct it. If you read those 3 sets of books you get 2 different names for the roll center, moment center. Yes, sorry, I am referring to the instant center. Just hadn't made it back to my computer. Adam's book is good, and I have a few circle track ones as well, I want to say the author is something like Bolles? I think if I was to graft something onto the front of it, I'd be better served by designing something that'd correct the geometrical woes as best I could, as well as swap to a steering rack in lieu of the bell crank configuration, but currently that's not in the budget of this broke engineering student. Maybe I'll do something like that as a "research project" on my '66, since it's pretty far gone anyway. 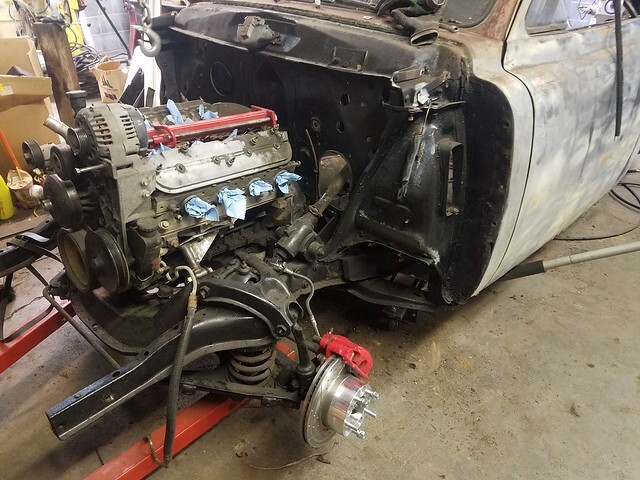 Do a search on Alan's '53 project. He's done the homework, drawn the angles and come up with as good an answer as we're likely to get. As for me, if I wanted to change the front suspension, a Corvette front subframe can be rolled under with minimum effort and good result. In 1963-64 on The Avanti with R3, the suspension was a mix of off the shelf production control arms (1963 Lark type/ 1951 type) with Lark type spindles, King pins, and shafts from 1951-51 that used steel bushings instead of rubber bushings. So you have half the puzzle on one car and the other half of the puzzle on the other car to make a stout suspension.. This was supposed to be a heavy duty suspension, but I've never tried it. Actually there are only Studebaker pins etc as the Lark parts are the same as all of the studebakers. Also the R3's had the upper inner a-arm mount lowered, the king pin, spindle and lower knuckle were different. All of this to get more camber gain while cornering. I forgot to mention that it is the upper control arm that uses the older non rubber inner bushings. The front kingpin, knuckle and spindle for the R3 lowered the front more than 1", I don't know the exact number right now. This is much better than using springs to lower the front. If you lower the suspension by modification of the springs you loose part of the camber gain. I have never seen an R3 up close, so if they moved mounting holes, and did some special race prep like a special knuckle they only did a couple. The Avanti parts books lists the knuckle as a Lark part and says 'all' . I have heard there was a special one, (in AU ) but the book says otherwise for the rest of the cars. The king pins are also Lark part numbers, nothing 'special'. Maybe he just swaps a few parts, drills a few holes, instead of changing the frame rails. The point was, to the poster- Yes, You have the parts, and they fit each other if you follow the book.